A very easy comment for people to make, when you are not personally affected by any extreme event such as a fire, or as the people along the southeastern seaboard are facing, a major hurricane. I used to be one of those who frequently made a comment like the one above from the safety of my home, fairly inland geographically, protected from opportunities of brush fires, earth quakes, and direct hits of hurricanes. But last year, that mentality changed for me. For the first time in three years that I lived in Florida, I was finally facing the possibility of dealing with a major hurricane. The order to evacuate, and the decision to disobey the order if made mandatory, is not an easy one for most to make. Sure, you will have your morons who just want the thrill. But there are many who do not have the choice. And now, having survived “Irmageddon” (Hurricane Irma) last year, I now have two different perspectives on how any why someone may be faced, literally, with a life or death decision. 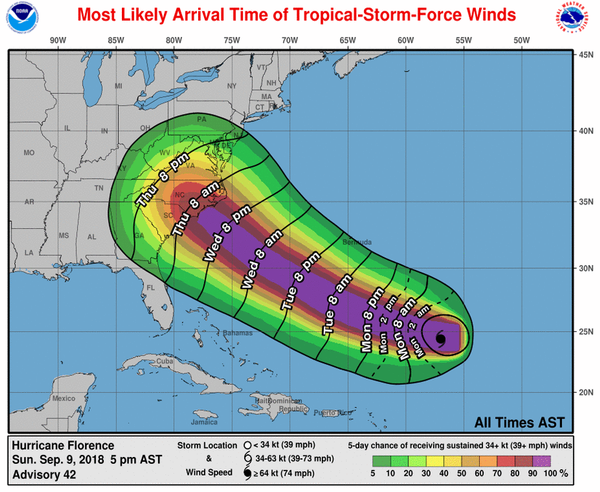 And so, it appears Florence has done the same thing. Appearing to be steering towards North Caroline, evacuees fleeing south, the storm is now predicted to turn southern as it approaches land, and travel south. So much uncertainty to deal with, and for many, limited resources, especially financially. As anyone who has gone through a hurricane will tell you, supplies disappear as soon a the first statement of landfall is announced. Gas runs out. Water and bread disappear off the shelves at grocery stores. And people begin to prepare to secure their homes with their storm shutters. Desperation begins to set in to find supplies, especially gasoline for cars and generators. People begin to travel further from the area affected, now depleting suppliers who where not only not expecting the rush, they were not prepared. And their supplies would soon run low or empty. For those who did evacuate from Irma last year, all told the same story. No gas. No hotels. People were booking hotels in northern Florida, realizing that they would not be out of harms way, made reservations further north, but never releasing the southern reservations. So those fleeing, only saw booked hotels, in spite of having vacancies. And if you had nowhere to stay, and ran out of gas, you were sitting, waiting to die in a major hurricane. All that any of us could do, if we had no ability to evacuate, was secure ourselves and our residences. There were shelters available, but for those who have never experienced this type of event, we soon found ourselves unable to “reserve” or apply to stay in a shelter. And shelters filled very quickly to capacity. For me, I relied on storm shutters, hoping to survive the storm surge of water. I did everything I could to make sure that I had supplies from water to batteries (for flashlights and a transistor radio), and of course food rations. I had not idea what life would be like afterwards. But one factor that people do need to keep in mind. First responders have no chance to save your life while in the middle of the storm. Heart attack, you die. Problem pregnancy, good luck. No one will be able to help you. Live in an apartment building, emergency personnel cannot get to upper floors with a stretcher with no power to operate the elevator. You make the decision to stay, you know these risks. And though it may sound like hyperbole, when officials issue warnings to give “next of kin information” to officials, it is quite real. If this is the first time you are going through something like this, you do not really think about how long it may take to get back home after you evacuate. And the truth is, it could be quite a while. Not only may roads not be passible, but supplies take days to arrive, and power could take weeks. There is nothing to come back to during this time. Sure, there is the rush to see the damage. But let me tell you, it is impossible to describe the feelings from the sights of the devastation. But there is also the want to begin to clean up and rebuild. Perhaps to get the jump on reporting to the insurance companies is another consideration. There is a want to return back to normal. And then, if this is your second go-round with a hurricane, you now have an idea of just how much it costs to evacuate, especially when it is long term, like weeks. You have to pay for gas, hotels, food, and still pay your monthly bills. I had no choice. I had nowhere to go. I did not have the resources to leave. There were a lot of factors that went into my decision. I made all the preparations that I could, and I believed them to be the correct ones for me. I notified my family of my decisions, and stated what I had done, to not only make it through the hurricane, but how I would communicate, when I could communicate. I made sure that my family was comforted during the storm. Which is why I say, before judging those who do not evacuate, not everyone is a just a thrill seeker for this type of emergency. The majority simply may not have a choice. But it is much easier to make these decisions from afar.